Elsevier is pleased to provide high quality MARC records created and delivered by OCLC® to customers who have purchased books on ScienceDirect. MARC records are available at no charge for all books on ScienceDirect. Please note that Elsevier does not provide MARC records for ScienceDirect journals. 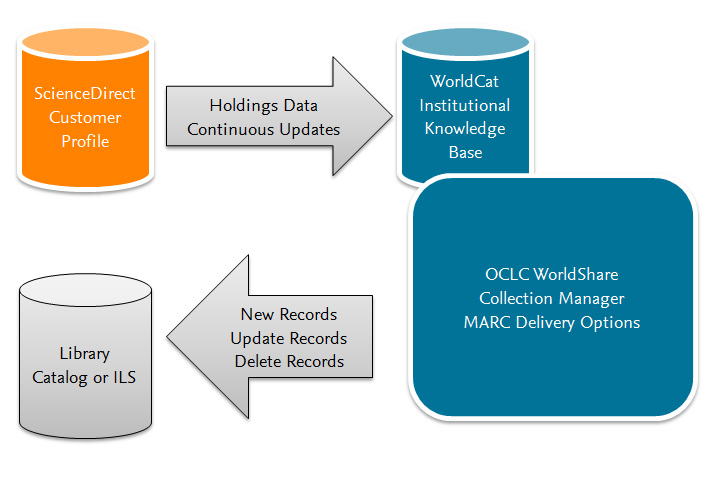 To receive MARC records, customers must complete the one-time setup process described below to enable data exchange and MARC delivery via the OCLC WorldShare Collection Manager system. Once the setup is complete, your WorldCat library knowledge base will be constantly updated with holdings data from ScienceDirect, and you will receive MARC deliveries (new, update, and delete records) automatically as your ScienceDirect holdings change. Your catalog will always match your ScienceDirect subscription without the need to place MARC orders for each book purchase or collection. Please be aware: resolution time will vary based on the complexity of your request. Please note, this process may take up to 3 weeks to complete. Fill as much information as possible that you know and submit that information to OCLC. In a few working days, you will receive a email from OCLC. Now that you’ve completed step 1 please click the button below to continue the process. Download the guide. It has step-by-step instructions for creating a token. Go to your instition's Elsevier Admin Tool to create a data exchange token. Please configure feeds of our Elsevier ScienceDirect holdings data to the WorldCat knowledge base for [insert your institution name]. Now that you’ve completed step 2 please click the button below to continue the process. Within 10 working days, OCLC will send an email confirming that the holding feeds for your institution have been configured. Once you have received the email, log in to your Collection Manager account and set the MARC editing options, delivery preferences and collections. Step-by-step instructions are available in the quick start guide here. When you have completed setting your delivery options, you may check to see if the MARC records are available. Please be aware that OCLC updates holdings records weekly. If you do not immediately see the records you expect, please allow 5 business days for the MARC records to appear in your holdings. Your institution is now setup to receive MARC records and have your holdings automatically updated whenever you purchase new Elsevier content. Please be aware: checking your OCLC account status may take 15 - 20 minutes. MARC delivery has moved to OCLC WorldShare Collection Manager. Setting up automated MARC record delivery will make your future MARC record downloads faster and easier. Click here to read more on how Elsevier is moving all MARC record delivery via OCLC WorldShare Collection Manager. This service is free for all Elsevier e-book customers and this account is separate from other OCLC services you are currently subscribed to. If you so not wish to use Collection Manager, MARC records can be requested and delivered via email. Please note: email delivery of MARC records may take between 20 - 25 working days. Email delivery of MARC records will not establish a WorldShare Collection Manager account. It will not enable any future delivery of MARC records, so you will need to request MARC records each time you purchase a new book on ScienceDirect. Do you still want to use email as the delivery method for your MARC records? For email delivery of MARC records please reach out to your Sales contact or send a request to this address: marc-records@elsevier.com . Please be aware that email delivery of MARC records can take 1 – 3 weeks.